I have always been a bit of an animal lover. As a child I had many pets, hamsters, gerbils, mice, goldfish, rabbits, guinea pigs, dogs… you name it, we had it. I think the only reason we didn’t have cats too is because my mam wasn’t a cat person. I knew when I became a parent that I would like my children to have pets of their own. Owning a pet as a child is a great way for children to learn about caring and responsibility, and I try to get the children involved is as many aspects of pet care as possible. We currently have two rabbits and two cats, and we absolutely love having them around. We consider them to be a big part of our family. It is estimated that 46% of UK households have a pet, which seems to indicate that we are a nation of pet lovers! Those of you that follow me on instagram will probably know that I share quite a lot of photo’s of my cats. I just can’t help myself! Especially now the kids are at school, I have to turn to the little furry members of the family for company when I’m off work, and they never cease to amuse me. I have been looking around for a pet related linky, but was surprised to find there wasn’t one (or at least, I couldn’t find one…). I thought that since pets are such a big part of family life for a lot of families, that it might be nice to have somewhere to share all of our pet photos and stories. So… after a few weeks of dithering and deliberating, I’ve finally decided to have a wee go at hosting a linky. Ladies and gentlemen, I bring you ‘Pawfect Pets’. Ok, ok, I know the name is a bit cheesy, and I know not all pets have paws, but the name just kinda stuck! The linky will open every Tuesday at 7am and will remain open until the following Monday at midnight. You are welcome to link up any posts, past or present, that feature your pets. The post can be a story, a photo, a pet product review… basically anything pet related! Try and comment on at least two of the other posts in the link up. 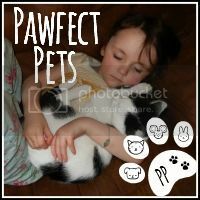 Tweet using the #PawfectPets and I will re-tweet. I look forward to finding out all about your wonderful family pets! If you like this linky, please share the love. It would be amazing to build a little pet loving community of bloggers. My linky goes live in the morning… Please come back and link up if you can! Great idea, I quite often write about my dog but have never come across any pet linkys.